Jeannine-Marie St-Jacques received a PhD in Biology, specialty in environmental science from Queen's University in 2007 and joined Concordia University's Department of Geography, Planning and Environment in 2017. She holds masters degrees in botany and mathematics. After her doctorate, she spend nine years as a Research Associate at the Prairie Adaptation Research Collaborative, University of Regina. 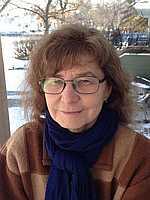 Her expertise is in paleoclimatology, climatology and hydrology. Her research integrates paleoenvironmental reconstructions with instrumental climate records and modelling efforts to address questions of resource managementC. She collaborates with a broad spectrum of colleagues and students, both in Quebec and abroad, who have expertise in the environmental sciences and studies, climatology, climate modelling, hydrology, botany, geology, statistics, aquatic sciences and Indigenous Studies.